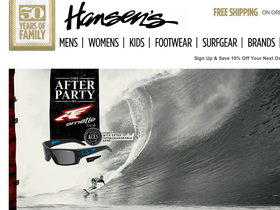 Shop Hansen Surf online at HansenSurf.com for all your surfing needs. HansenSurf.com not only offers clothing, but also surf shop essentials like surfboards, wax, fins, wetsuits, sunscreen, and more. Hansen Surf also carries backpacks, luggage, purses, bags, and accessories. Hansen Surf features some of the top known surf designers today including, Hurley, Billabong, Roxy, Rip Curl, RVCA, and others. Visit 58Coupons.com to learn how you can save with Hansen Surf coupons, Hansen Surf deals, Hansen Surf discounts and Hansen Surf promotions when shopping at HansenSurf.com. HasonSurf.com offers Free Shipping with online purchases over $75 or more. Click link to shop. Save 15% on your entire order from Hansen Surf with this coupon code at checkout. Shop the Clearance Sale at HansenSurf.com where you can save up to 50% on select items. Hurry, items are going quickly! Click link to view. Spend up to $75 and hansensurf.com will ship your items for a flat rate charge of only $5.90. Spend over $75 and items will ship for free. Get spending by clicking the link. Hurry on over to HansenSurf.com to save 50% on Smith Goggles. Click link for selection.